I thought this was really good. You could use chorizo, soyrizo or even ground beef in place of the sausage. I love quinoa with avocado! In large skillet add broth and quinoa. As that comes to a boil add beans, tomatoes, corn and jalapenos. Add garlic powder, chili powder, and cumin. Cover and simmer until liquid is gone and quinoa is cooked. Add lime juice, cilantro and avocado. Serve hot. Yield: 8 servings. Per serving=210 Calories; 6g Fat (23.6% calories from fat); 9g Protein; 34g Carbohydrate; 6g Dietary Fiber; 0mg Cholesterol; 555mg Sodium. Preheat oven to 350*. Spray 9×9 pan with cooking spray and set aside. In small bowl, add corn muffin mix, egg and water. Combine and set aside. 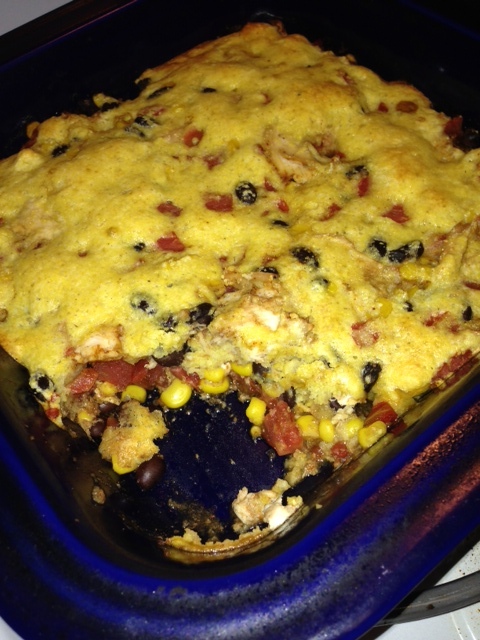 In medium bowl add taco seasoning, tomatoes, chicken, black beans, and corn; pour into prepared pan. Top with corn muffin mix. Bake 30 minutes or until cornbread is lightly browned.